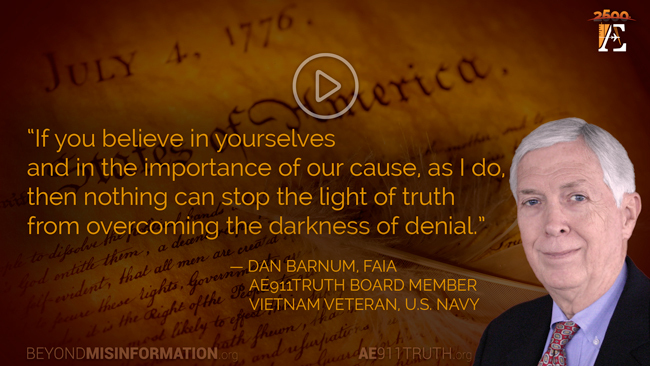 In this special Independence Day message, Architects & Engineers for 9/11 Truth board member Dan Barnum, FAIA, pays homage to you — the great supporters and activists who have served our country by educating others about the scientific evidence surrounding the September 11, 2001, destruction of the three World Trade Center towers. By speaking out despite overwhelming social resistance, you carry on the legacy of previous generations of great Americans who displayed the same moral courage and fortitude. I am Dan Barnum. I'm an architect with over 50 years' experience, a Fellow of the American Institute of Architects, and a board member of Architects & Engineers for 9/11 Truth. I'm also a veteran of the Vietnam War. I've had the honor of serving my country alongside some of the greatest people this nation has ever known. When I say this, I'm not talking about my military service, though I have great respect for the individual courage of soldiers, sailors, Marines, and airmen, and the sacrifices they make today. Today, I'm talking about my service as a member of Architects & Engineers for 9/11 Truth, and all of the thousands of courageous truth activists who for several years have done everything they can to educate their brothers and sisters about the crime that was committed against our nation on September 11th, 2001. In keeping the fires burning on this important issue, many of you have made personal sacrifices for the noble ideal of "truth" and to secure justice for the victims of that terrible event. On Independence Day, we look back at the unfolding saga of our country from the birth in 1776 to today, and we remember all those who have stood up in defense of our rights and ideals — when doing so wasn't popular at the time. The 9/11 Truth movement stands arm-in-arm with the spirit of those great people who, through history, ended slavery and fought segregation, as well as those in my generation who ended a war that was based on a lie — a war that needlessly claimed the lives of 58,000 young American military folks and millions of East Asians. Though resistance to the facts still exists, your efforts are not in vain. Every time you reach out with scientific evidence of what happened on 9/11 and open a mind, you chip away at that collective wall of cognitive dissonance. You also help change the course of human history. I have no doubt that your efforts have contributed to the increased political vigilance exhibited by our fellow citizens in recent years and to the increased skepticism of political agendas that our country requires to keep on the right track. I can only encourage you today to keep going, just as I intend to do, no matter how long it takes and no matter how ferocious the resistance we face. We will have a new investigation, and the world will acknowledge what really happened on that fateful day. If you believe in yourselves and in the importance of our cause, as I do, then nothing can stop the light of truth from overcoming the darkness of denial. I thank you for your continued service to our nation, and I wish you a happy, safe, and meaningful Independence Day.